Blessed by Gods, Kerala is a travelers dream come true. 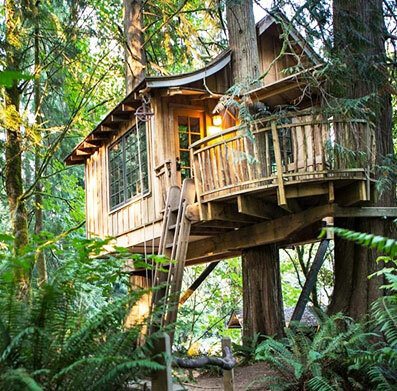 To top it, the best of Kerala with treehouse stay offers memories of a lifetime. The serene backwaters of Kerala are an unmatched beauty. Soak in the bliss of this heavenly spectacle with a tour of the ethereal backwaters. Fulfill your fantasies with Wayanad tour with Vythiri Treehouse, that offers a stay in a cottage built amid trees. Avail the chance to soak-in natural bliss. Begin a romantic journey with your partner with a Kerala Honeymoon Tour. Enjoy the beautiful surroundings, activities and experiences coupled with cherished memories. Journey through the breathtaking backwaters of Kerala with Kerala backwater tour. The houseboat cruises from the town of Alleppey to Kumarakom on a traditional houseboat. Kerala houseboat tour offers the opportunity to explore the picturesque backwaters of God's Own Country. Arrive to Cochin and sojourn through the charming backwaters at Alleppey. Treat yourself to ancient bliss with Kerala Ayurveda Tour. The age-old science of health and wellness rejuvenates body, mind and soul like no another. Romantic Kerala Tour creates the perfect setting for love. Plan a trip with your partner and discover love in its true form in the heaven on Earth. Enjoy a fun outing to Kerala's favorite beach town with Kovalam Tour. Overlooking the Arabian Sea, the seashore is perfect for relaxing, watersports, Ayurveda and more. Fondly referred to as "God's own Country"; Kerala with a vast coastline fringed with coconut palm, extensive stretches of biodiverse Western Ghats and cultural vibrancy is one of the most popular tourist destinations in India as well as Asia. Included in the National Geographic Traveller's list of "50 Places of a Lifetime", Kerala with its equitable climate, long shoreline with over 50 serene beaches, extensive tea plantations and spice fields, extensive network of canals and water channels popularly known as Kerala backwaters, diverse wildlife and the ancient art of healing Ayurveda has intoxicated travelers since the time of Greeks who sailed to Malabar Coast in search of riches and pleasure. The ancient gateway and the most popular still is the coastal district of Kochi (formerly Cochin). The old quarters of this city still reverberate with the colonial charm which brings out the long historical connection of this port city; most popular and iconic sights being Fort Kochi and the Chinese Fishing Nets. Down south, Trivandrum (now Thiruvanathpuram), serves as the gateway to the coconut palm fringed backwaters of Kerala and the balmy beaches of Varkala and Kovalam renowned as popular destination for Ayurveda and healing. The verdant green state which is both mentally and spiritually uplifting makes you want to slow down, for Kerala is a place for relaxed holidays. Enjoy the tranquil beaches, live the romance of the extensive network of canals and lagoons that form Kerala Backwaters, behold the sight of mud splashed elephants in the wild, let your taste buds tingle with the eclectic cuisine, dance to the rhythm of festivals and celebrations of the vivid culture because there's no rushing, just romancing when you are holidaying in Kerala. Unarguably, one of the best features of holiday in Kerala is the backwaters. A mystical ride from the historical Kollam town to the most popular backwater destination Alappuzha in the Kuttanad region aboard the traditional kettuvallam brings out the true essence and romance of Kerala. Explore travel themes, destinations and activities and Kerala tour packages to plan your holiday in Kerala for a trip of a lifetime.